Hey, 2017. Here's to hoping it's a year filled with plentiful functional food, optimal health, and being at ease with ourselves and our environment. I ended 2016 skiing with my family and got sick half way through. Not ideal, but it's been more than a year since I've been that sick. That's a huge deal for someone who used to have chronic immune deficiencies...diet, state of mind, and support for the frickin win. The day we got back to the East Coast I stocked up on organic detoxifying and immune-boosting produce and herbs. I read Disease Delusion by Dr. Jeffrey Bland over the holiday, and learned so much about functional medicine I plan on implementing in 2017. 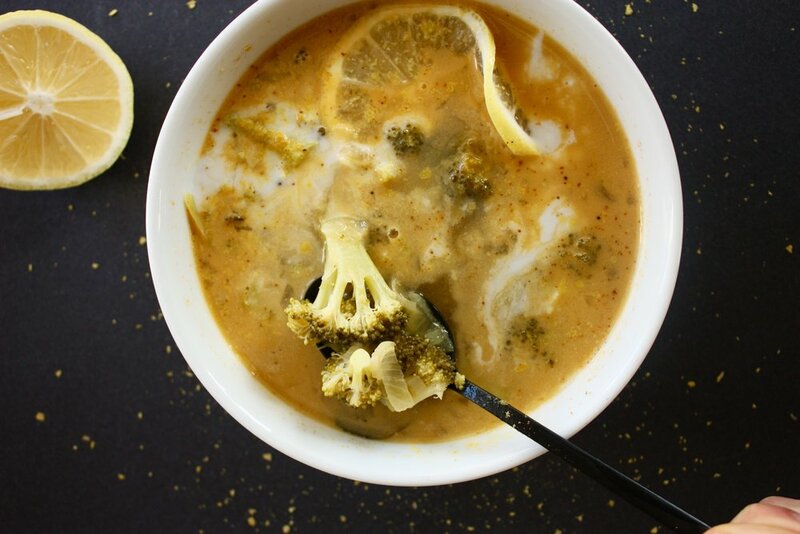 He's a big proponent of the detoxification properties in cruciferous vegetables, so if you feel like starting the year out fresh and clean, this soup is for you, too. 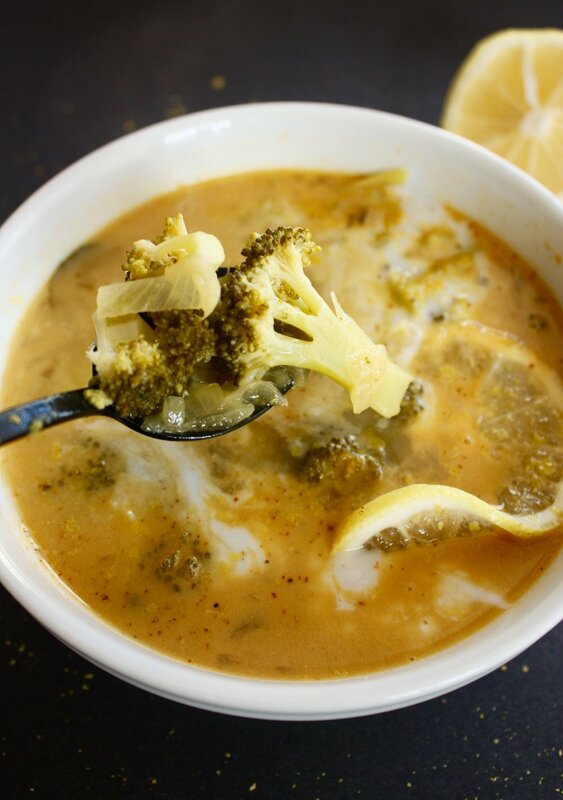 This broccoli lemon soup is warming, soothing, hearty yet light enough to go for a second bowl. Enjoy! Cut broccoli into bite-sized florets. Heat ghee in a medium-sized pot over med-high heat. Toss broccoli florets into the pot, followed by bone broth. Bring to a boil, then reduce to a simmer for 10 minutes or until broccoli is tender but not mushy. 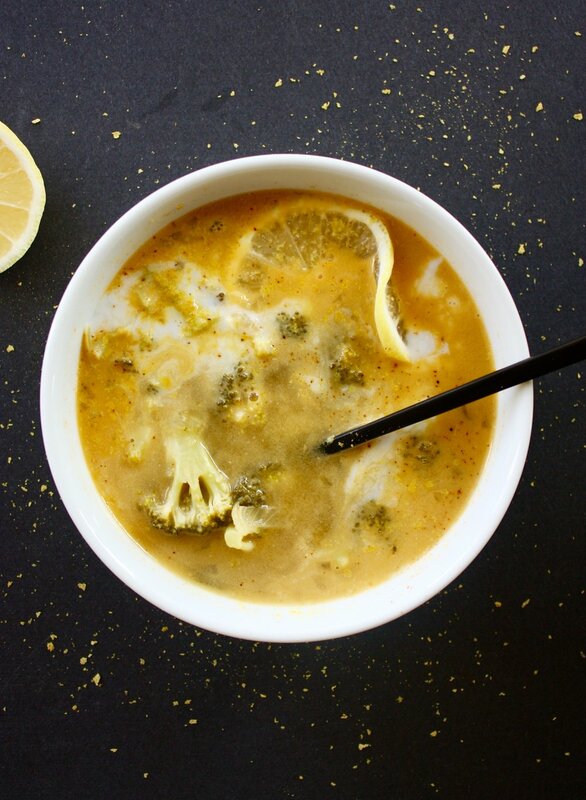 Juice the lemons into the soup, stir in coconut milk and nutritional yeast. Serve hot.